Are there folders on your hard drive bulging with digital photos you never see? Perhaps you post one good photo on a blog, choose another one as a new profile picture, or e-mail a couple of good shots to friends and family. And maybe once in a while you print and frame a particularly meaningful photo. But most of your photos just sit on your computer or are stuck on your phone. Is that all you can do with the multitude of fine images you capture? Not at all: one option is to create a digital scrapbook that can showcase more of your pictures. Digital scrapbooks differ from photo albums or photo sharing Websites because they enable us to tell the larger story behind a featured snapshot. By choosing a color scheme for the page background, a certain type of font for the text, and adding special creative touches (called embellishments in digital scrapbooking lingo), you can create a richer context for the photos you share. For example, you might create a series of scrapbooking pages about that great afternoon at the lake, using page backgrounds with blues or greens to evoke the feeling of the water and the shore, a relaxed, playful font for the text that reflects a friendly mood, and embellishments like water droplets or flowers to enhance the overall effect. 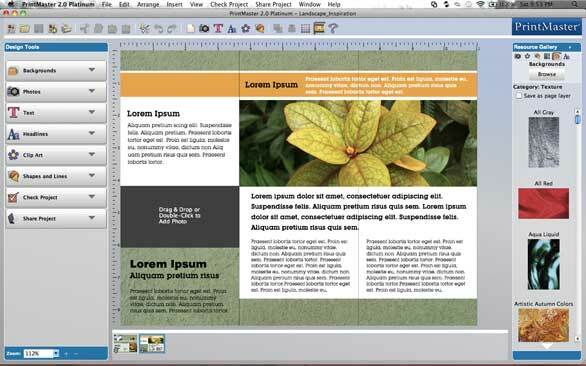 The practical techniques you use to actually create the page are fairly straightforward, and you can use your favorite image editing software such as Apple’s iPhoto ( ), Adobe’s Photoshop Elements ( ), Photoshop ( ), or Acorn ( ) to do it. Some programs, such as iRemember ( ) and iScrapbook ( ) are designed specifically to help you pull together all the pieces and provide extras, such as professionally produced embellishments. While the versatile PrintMaster ( ) does not offer specific scrapbook templates, you can easily use this program for your scrapbook, as well as other artistic projects. Digital scrapbooking software offers page backgrounds, clip art, fonts, and more to help your pages reflect the mood of the images. Showcase the beauty of a wildflower meadow through different seasons as part of your environmental group’s fundraising efforts. Prepare a digital scrapbook of your high school marching band’s trip to the state finals (and this can be used for recruitment and fundraising next year). Design a digital scrapbook of favorite family recipes, complete with the stories of the families and cooks involved. Create a digital scrapbook of all the four-footed friends in your family or group, and share it with others as a reminder to support your local animal shelter or rescue group. Because you create your pages digitally, you can share them by e-mail or on the Web easily. If you prefer to have a genuine, hold-in-your-hands scrapbook, you can have the scrapbook professionally printed (iScrapbook and other scrapbooking programs offer online services that do this for you) or print the pages on your own color printer. Whatever type of project you’re aiming for, the heart of your digital scrapbooking page is the living story that is captured in that photo. If you start with the photo as your focal point and build a creative page around it, others viewing your page are likely to enjoy the richness and fun of the experience, and who knows—they may be inspired to tell their own stories in a similar way.